Check for Water Before you "Go". Am I the only one who has had the experience (in a johhny-on-the-spot or an airplane toilet) where I'm frantically pumping the foot pedal and flushing lots of that blue water down because there wasn't any in the toilet when I started? Invariably it happens when there's a line up of people outside the door, and I don't want to emerge to face the next person in line (bound to be a beautiful woman too) unless I've been able to "flush properly." 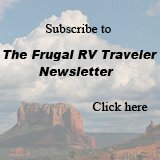 Lesson learned applies to my RVing life too - You'll use less water to flush if you just make sure there's some water in the bowl BEFORE you sit down.